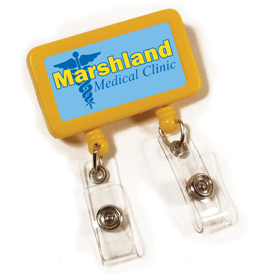 Our retractables are imprintable with up to 3 PMS colors. They are a great solution for company or school ID badges. They easily clip on to your belt loop for convenient ID swiping! BizPins' "No-Surprises-Pricing!" includes: steel clip, up to 3 PMS screen printed colors, 28" retractable nylon cord, vinyl snap closure and individual poly-bag. Standard Production Time = 3 weeks from receipt of usable art. 2 week RUSH available (Please call for pricing. Pre-Production Samples - $50.00(G), rebated on orders of 1,000 pieces or more. Add 2 weeks to delivery time. 5,000 minimum, please call for pricing.